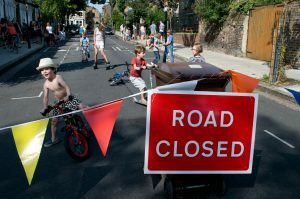 Residents close off their streets to through traffic for a few hours weekly or monthly, so that children can play out more safely and neighbours come together – making streets friendlier for all. Fifty streets have taken part in the idea in Hackney. Schools, nurseries and other organisations are involved too. To get a taste of a play street in action, watch our short 3-minute film, see link above, and also read about the experiences of people running sessions. 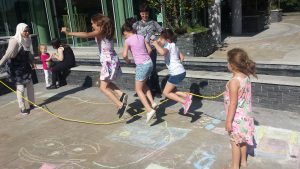 BBC News interviewed residents and children taking part at a play street in July 2017 – watch here! Play out as often as once a week! One of first play streets in Hackney kicks off! Neighbours volunteer to ‘steward’ road closures. People living in the street can still drive in and out at 5mph, guided by the stewards. Through traffic is redirected. In some Hackney estates residents are taking a different approach – coming together for play sessions in public spaces and paved areas, without closing the street. Our project offers free support to parents wanting to try this model too. Contact us if you’d like to know more. The Hackney Play Streets project is part of Hackney Play Association and is funded by Hackney Council. We offer free support to residents, schools and other community organisations that want to take part in the idea. For example we can meet you for a start-up chat, help you with photocopying letters, and give advice as you go along. We also aim to attend first play street sessions and will provide stewarding equipment. Find out more on the kind of help we offer here. Our approach is based on the ‘playing out’ model first pioneered by Playing Out, the national organisation that supports anyone who wants children to play out in their streets. Hackney was the first London borough to adopt the idea and only the second place in the UK, after Bristol. In 2013-14 we commissioned Tim Gill to carry out a more detailed evaluation. See the Final full evaluation report and Executive Summary.